The city's Coney Island plan suffered a major setback Wednesday as officials admitted they had not ruled out the use of eminent domain to acquire land for the project. The admission, which threatens property owned by developer Thor Equities, came as some City Council members strongly indicated they would vote against the zoning plan this month when it goes before the full Council. There’s a common tactic that accompanies most development fights: packing a public hearing. Usually this is carried out by a variety of groups fighting or supporting a given project—advocates, unions, angry neighbors, wary businesses—who enlist (ideally) scores of people to testify at a hearing in favor of their position, filling a room with sign-holding supporters and making it seem like their argument has more support than the opposition's. But for a City Council hearing on Coney Island on Wednesday, the Bloomberg administration bused in supporters of its own plan, only to provoke sharp criticism from the Council, as members alleged a misuse of taxpayer funds. Value aside, the act is emblematic of broader Bloomberg administration efforts to counter opposition to its own development plans, efforts that can often be deafening and that threaten initiatives. 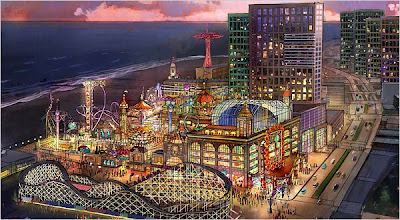 The CIDC, which is also a local community development organization, has spent considerable time and resources trying to publicize the city’s plans for Coney Island. In addition to organizing the buses, it’s enlisted the lobbying and community outreach firm Yoswein New York, and has rounded up mailing lists and signatures in favor of the plan at Brooklyn events. When another controversial project, the proposed mega-development for Willets Point in Queens, came up for public review last year, the Bloomberg administration committed $250,000 in funds to a group set up to effectively lobby community members, elected officials, business leaders and others in favor of the controversial project.